A stye is an infection, typically a bacterial infection, which causes a painful red lump either on the edge or inside of the eyelid. Bacteria grow at the root of an eyelash follicle or inside an oil gland. The bacteria can be a result of poor hygiene, touching the eyes with unwashed hands or chronic inflammation. The stye resembles a pimple or a boil and is usually filled with pus. A stye does not pose a risk to vision and most often heals without treatment within a week. 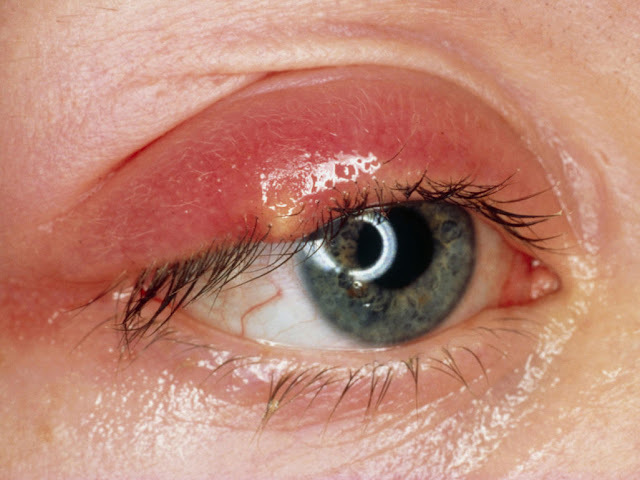 However, a stye may require treatment with a doctor if the infection does not resolve with at-home remedies. A normal stye will come to a head in approximately three to four days and rupture. The fluid will drain, and the lump will heal within a week. If the stye does not heal independently, the individual should visit a physician for treatment. A doctor may prescribe medicated eye ointments or eye drops for long-term styes. In order to relieve pain and pressure for the individual, the doctor may choose to lance and drain the stye instead of waiting for the stye to drain naturally. Some individuals are at a higher risk for developing a stye than others. Contact lens wearers who do not cleanse lenses effectively or daily are at risk for infection. Women who use eye cosmetics longer than six months or who share eye cosmetics with others may spread bacteria which can cause a stye. All individuals should protect eyes against heavy dust or air pollution when possible and avoid touching the eyes with unwashed hands or sharing towels and other personal items. A stye is not harmful or dangerous to an individual's vision. However, the condition is painful and irritating. Taking simple steps to avoid spreading bacteria to eyes is an easy way to prevent the onset of a stye.